Donovan Deane McLaughlin, an esteemed jurist, has spent 36 years in the profession of law in Stark County. He received his B.S. degree from the College of Wooster in 1925 followed by a Bachelor of Laws from Western Reserve College of Law in 1928. During the time he was in law school, he worked for the juvenile court in Cleveland. Following graduation, he began the practice of law in Massillon and then entered into a continuous career of public service by becoming an assistant to the Stark County Prosecutor in 1933, a position he held for the next nine years. Successively, Mr. McLaughlin was elected Stark County Prosecutor in 1942, appointed to the Stark County Common Pleas Court bench by former Gov. Frank Lausche in 1952 and then elected to the same position in his own right. In 1956 he was named to the Fifth District Court of Appeals and served there until his voluntary retirement in 1967 when he announced that he would not seek reelection to a third term. He now serves in Ohio courts by assignment from the Chief Justice of the Ohio Supreme Court. He is married to the former Eleanor Pearson and they have two daughters and a son. 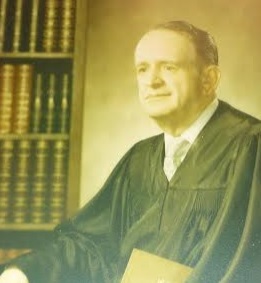 Biographical update: Judge D. Deane McLaughlin passed away in 1973. His spouse, the former Eleanor Pearson, passed away on November 1, 1986. They are buried together in Newman Creek Cemetery, also known as Chapel of the Cross United Methodist Cemetery, North Lawrence, Ohio. They are survived by two daughters and a son. Information regarding any grandchildren is not currently available.